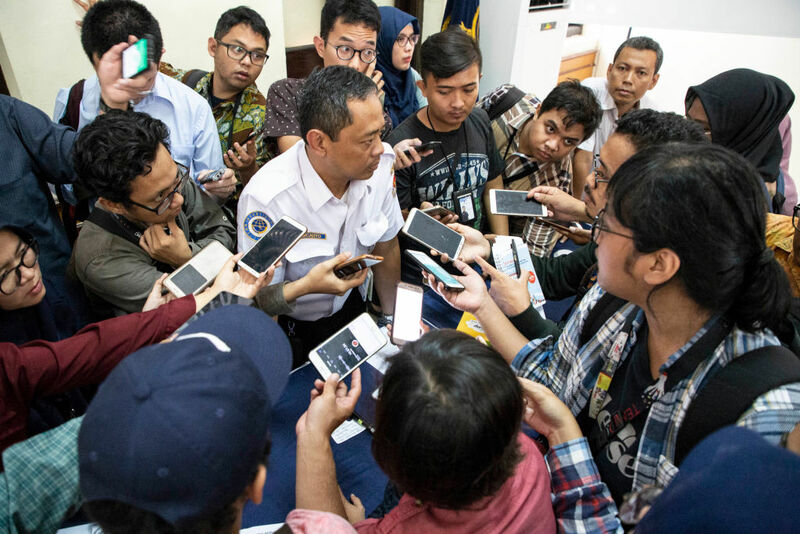 Enlarge/ Cpt Nurcahyo Utomo (head of Flight Mode Indonesian Safety Transportation Committee) during the press conference, in Jakarta, Indonesia, on November 28, 2018. More evidence supporting the theory that faulty sensor data caused the crash of a Lion Air Boeing 737 MAX in October has emerged from the aircraft’s flight data recorder. A report released on November 28 by Indonesian crash investigators shows that the pilots of Lion Air Flight 610 fought with the aircraft’s maneuvering characteristics augmentation system, or MCAS, nearly from the moment the jet took off from Jakarta on October 29. And the aircraft had suffered from a similar problem on a flight from Bali to Jakarta the day before—a flight that was completed safely after the pilot shut down the 737 MAX’s automatic anti-stall system. “In our view, the plane was not airworthy” during its previous flight, said Nurcahyo Utomo, head of Indonesia’s national transport safety committee (KNKT), in a press conference today in Jakarta. Utomo faulted Lion Air’s maintenance and safety culture in the crash, though a final finding on the cause of the crash is likely months away. The 737 MAX lost in the crash had repeatedly had problems with its airspeed and angle of attack (AOA) sensors, both of which feed into the MCAS system. One of the AOA sensors on the lost aircraft was replaced after the problems on the flight from Bali to Jakarta the day before, and the plane was put back into service. The MCAS uses inputs from these sensors to detect if the aircraft is likely to stall—losing enough lift to stay airborne—and automatically adjust control surfaces. Those adjustments would push the nose of the aircraft down to increase the lift generated by the wings with a combination of improved air flow over the wings and increased airspeed. “The pilots fought continuously until the end of the flight,” Utomo said. Shortly after take-off, as the aircraft approached an altitude of 1,000 feet, the flight data shows the aircraft dipped out of its climb. After recovering from a sudden drop in altitude, the pilots struggled to maintain level flight after passing 3,000 feet, before the aircraft went into a deep dive just over 10 minutes after take-off. Boeing was accused by some pilots in the US of not properly documenting the nature of changes made to the MCAS system in the 737 MAX, an aircraft that only entered service in 2017. Those details were published in an Operational Manual Bulletin issued by Boeing at the Federal Aviation Administration’s instruction on November 6. But a Boeing spokesperson said that “the appropriate flight crew response to uncommanded trim, regardless of cause, is contained in existing procedures” within the flight manual for the 737 MAX, and company officials felt that additional details of the new system weren’t necessary. According to Capt. Dennis Tajer, a spokesman for the American Airlines pilot union and a 737 pilot, “in the previous model of the 737, pulling back on the control column, Boeing says, will stop a stabilizer runaway.” But that approach doesn’t work with the new 737 MAX system—the pilots have to disable the stabilizer.